Just when I started to get really excited about fall/winter fashion, Kerry Washington wore a striped dress at Variety's StyleMakers event, according to Perez Hilton, and made me miss summer and wearing all the nautical stripes I could get my hands on. Seriously, how is she so freaking adorable? The Scandal star stepped out for WWD and Variety's StyleMakers event in Culver City on Thursday, and if possible, upped her chic factor even higher by wearing the greatest striped dress I have ever seen. Even though it's definitely more of a summer pattern, I don't even care. She looks fan-freaking-tastic. The cream and navy frock was off the shoulder, and hit just below her knee. Though she kept her accessories minimal, Washington absolutely nailed her shoe game, pairing her striped dress with a pair of striped Nicholas Kirkwood pumps. And now I can't decide if I want the shoes or the dress more. 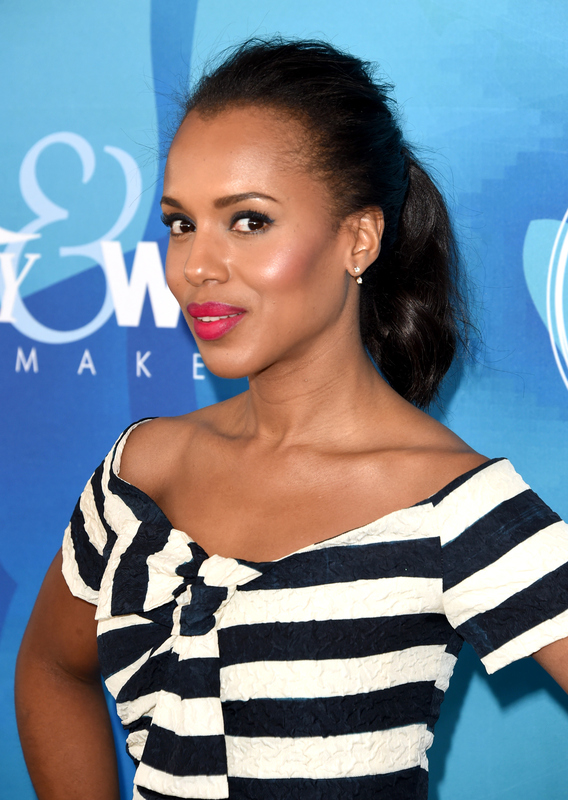 But in pure Kerry Washington fashion, it wasn't just her style that was on point, she also had flawless hair and makeup. She wore her hair pulled back and off her face, and rocked a smokey eye with bright pink lipstick. OK, winter, hurry up and end already. So flawless, right? Check out her makeup up close. This woman is perfect. Literally. If you're now missing summer, here are seven ways to wear stripes in the winter and stay warm. You can never go wrong with wool. The warmest way to wrap yourself up is with summer stripes on a scarf. The lower the hemline, the warmer you'll be. Add a pair of tights and you'll be even better. Hide your hair from the rain and snow with a cute striped beanie. A long sleeved striped tee is perfect for layering. A long sleeved dress is more cold-weather appropriate. If you're like me and literally live in leggings in the winter, then try a striped style.